Every business owner knows that visibility is the key to success. The one who wins is the one people know the most about. This is why companies spend literally billions of dollars to run one ad during the Super Bowl. They realize that given the huge audience, the investment is more than worth it. The same holds true for businesses who can’t afford a billion dollar Super Bowl ad. Visibility is everything and what better way to promote your business than to invest in a traveling advertisement. Vehicle wraps have been surging in popularity because they are one of the most effective, fun, engaging, and affordable ways to advertise. We’ve seen mobile pharmacy trucks with pills all over them, we’ve created mobile pumpkins and snowmen…you’d be surprised what you will pass on the Interstate these days. The possibilities are limitless when it comes to creating a unique vehicle wrap for your business, and in our experience, the crazier the better. It’s all about increasing engagement, making a statement, getting people’s attention, and getting them talking about your business. Unlike traditional means of advertising, vehicle wraps take the ad to the people…ALL the people. In fact, the Outdoor Advertising Association of America recently concluded a study that stated that a majority of vehicle wraps reach an estimated 30,000 to 70,000 people daily. Can you imagine trying to reach that many people through traditional advertising? Due to the flexible design nature of vehicle wraps, you can create just about anything and put it on four wheels…or 16 or 18 wheels! 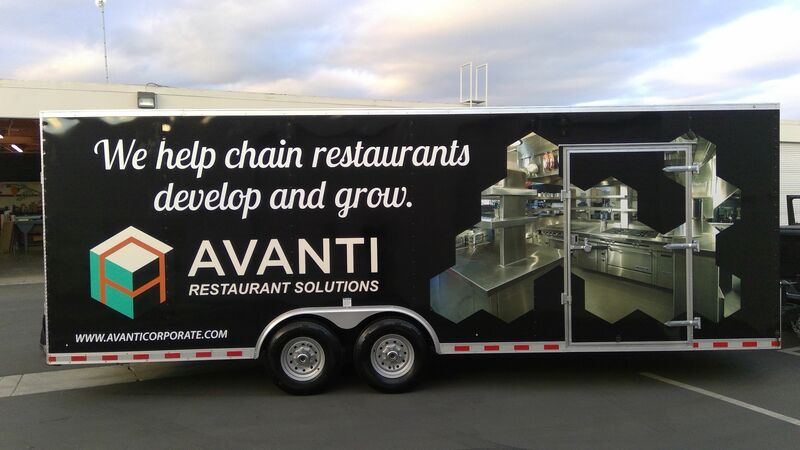 If you can imagine it, we can create it and wrap it around your vehicle or fleet and get you on the road to success. Let’s talk about a few more of the benefits of vehicle wraps. As we mentioned earlier, the exposure rate of vehicle wraps far outweighs any other form of traditional advertising. People can skip ads or mute commercials on their devices, but they can’t help but look at a brightly colored vehicle passing them in the next lane. If your business includes making deliveries or providing services at people’s homes or businesses, vehicle wraps are the perfect choice. Think of the last time a service van was in your neighbor’s driveway. You probably knew exactly what was going on due to the branding on the vehicle. Vehicle wraps work even when you’re not! Bonus! The newness of the concept of vehicle wraps is another reason they are wildly popular and will remain so for years to come. Remember bringing in the mail and thinking to yourself, “If I get one more piece of advertising junk mail I’m going to lose my mind!”? Yeah, no one says that about vehicle wraps. What we hear when our vehicles are out on the road is more along the lines of, “What a really cool idea! That truck is amazing.” And oh, by the way, you just saw the branding and slogan for my business. Not only are vehicle wraps eye-catching, memorable, and entertaining they are unique and nontraditional enough to make people stop and take notice. From time to time, a business undergoes rebranding. This can be incredibly expensive when you consider the cost of replacing business cards, fliers, redesigning your website…the expenses can add up quickly. The one expense businesses won’t struggle with is rebranding their vehicle. Vinyl wraps can be easily removed from vehicles and new wraps can be designed and placed in no time. We understand that you have a business to run. You don’t have time to be in between brands and not advertising. Vehicle wraps make the transition quick and easy.